Have you ever gone into a music shop and stared in awe at the artwork of those heavy metal albums? Have you ever wondered how an entire world would look in the image of that artwork? Well, thanks to Slain you don’t have to wonder how it would look anymore! 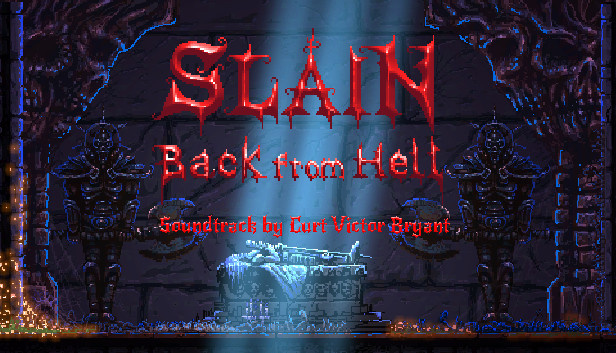 Slain is a 2D action platforming game set in a world that can only be conceived thanks to the artwork of the heaviest of heavy metal bands. You play as Bathoryn, a warrior who isn’t given much of an introduction and is awoken from his slumber to fight Vroll. As the hero, you must fight a world that has been defiled traversing the most gruesome and brutally difficult levels that could be created. I have mentioned the heavy metal theme a lot, and that is because the game is just oozing by its influence. 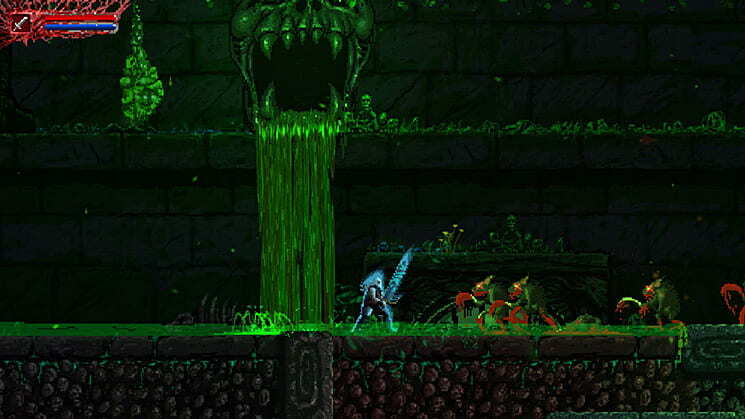 Slain doesn’t bore you with too much backstory, it takes you to a world filled with gore and even gorier enemies. From the enemy design to the backgrounds of the levels, every nook and cranny is presented to give you that feeling of brutality. At the beginning it feels so surreal to be navigating these grotesque levels as you press on. The art style is certainly something to be impressed at, however after a while it begans to wear off on the eyes. What at first glance feels like a mesh of flesh and blood with dangerous contraptions, starts feeling quite “noisy” after the first hour or so. The truth is that many of the levels are extremely loaded with those same heavy metal elements. While they are individually wonderful to stare at, when looking at the big picture they just end up meshing together into a world where it is hard to highlight certain elements. Maybe some people prefer visually loaded levels, but personally I prefer cleaner game design where you can actually distinguish the level at hand from the background details, and in your mind paint the depth of view that ties it all together. Such a distinction would have been much appreciated, especially considering the precision that is required to play this game. If you have read reviews from other sites, you probably also read the word “hard” a lot. 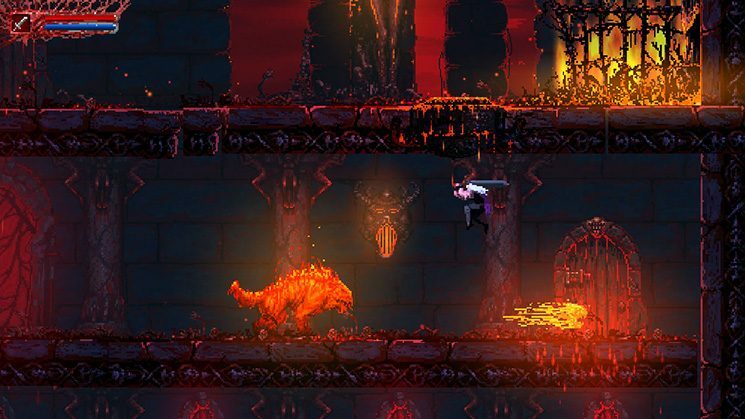 Slain is certainly a very punishing game, and one that is sure to kill you more times than you will probably admit. 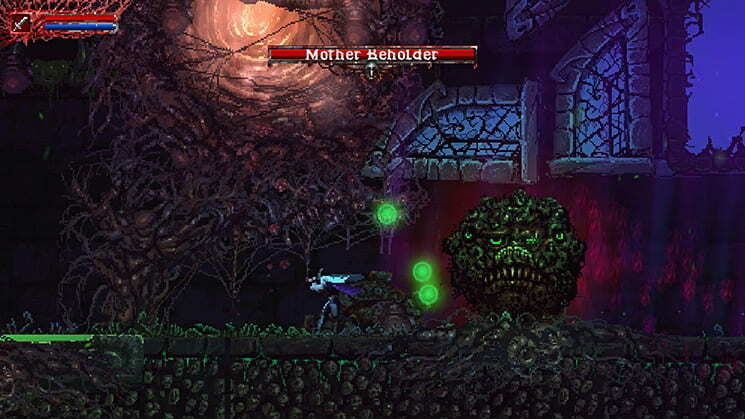 Precision platforming is second to the enemy encounters which will bulldoze you if you aren’t prepared. Even if you managed to survive the arena battles, you shouldn’t drop your guard, or else you might find yourself killed by one of the insta-death traps. Difficulty is certainly a very popular element in modern games that want to distinguish themselves from the pack, however I found Slain’s difficulty to be more akin to what I would call “fake difficulty”. What I mean to say is that the game doesn’t offer you substantial challenges that press you against the wall, but rather utilize cheap ways to take your life away. One of the reason I think the difficulty is not enjoyable is due to the shallow combat system. As Bathoryn your moveset consists of dealing a combo attack with your sword by pressing Y, shotting magic with your R button which can be a single shot or a charged shot, using X to block attack or L to backdash. For more advanced techniques, you can charge your sword attack which will takes some time and has to be released at a precise moment to unleash your attack. You can also block at the right time to parry the enemy’s blows and leave them open to a counter attack. And that’s pretty much it. While the combat does sound as it offers some interesting options, in the end it always comes down to the same elements. You will be attacking enemies from a distance in order to have the last hit of the combo stagger them. Staggering them is so important because the enemies don’t flinch in any other way aside from parries. Combat quickly devolves to a routine that is best explained by positioning yourself at a safe distance from the enemy and doing your full combo so that you always stagger the enemy before he actually attacks. Magic is hard to come by and only replenishes at checkpoints or my killing an enemy after a counter attack. The quantity restored is pretty limited, so being a magic user is not a reasonable option. On the animations department, there is something that bugs me to no end. When you start playing, you will most likely notice that the game doesn’t run at 60 fps. Not only that, if you pay enough attention you can see that during the jumping arc, your character is constantly placed some pixels higher. It is hard to describe, but if you ever dabbled in game creation it does feel like your early attempts at simulating movement by replacing the X and Y position every frame. The end result is a movement that feels frameskippy as opposed to the usual smoothness found in similar games. That’s not to say everything is bad, I for one noticed extremely fluid animations during your usual 3 hit combo and while using charge attacks. This actually confuses me more, because at the beginning I thought that the game just couldn’t reach the framerate of its bigger console brothers, but finding the fluidity in the animations tells me that’s not the case. At the end of the day, I feel like Slain is a game that seems very enjoyable on the outside but once you get into it, you start noticing those jagged edges. I did have some fun playing, but enjoyment quickly turns to annoyance. I wish the game had more in terms of character building like experience gains or at least some sort of currency, it would at least give some incentive to fight every monster out of the forced arenas. I’d say this is one of those games whose purchase I don’t regret, but am glad that I cleared and probably won’t play it again.